For a chronological guide to this subject, see Timeline of the presidency of Woodrow Wilson. Wilson was a leading force in the Progressive Movement, and during his first term, he oversaw the passage of progressive legislative policies unparalleled until the New Deal in the 1930s. Taking office one month after the ratification of the 16th Amendment of the Constitution permitted a federal income tax, he helped pass the Revenue Act of 1913, which reintroduced a federal income tax to lower tariff rates. Other major progressive legislations passed during Wilson's first term include the Federal Reserve Act, the Federal Trade Commission Act of 1914, the Clayton Antitrust Act, and the Federal Farm Loan Act. While passing of the Adamson Act — which imposed an 8-hour workday for railroads, he averted a railroad strike and an ensuing economic crisis. Wilson's administration also allowed segregationist policies in government agencies. Upon the outbreak of World War I in 1914, Wilson maintained a policy of neutrality, while pursuing a moralistic policy in dealing with Mexico's civil war. Wilson's second term was dominated by the America's entry into World War I and that war's aftermath. In April 1917, when Germany resumed unrestricted submarine warfare, Wilson asked Congress to declare war in order to make "the world safe for democracy." Through the Selective Service Act, conscription sent 10,000 freshly trained soldiers to France per day by summer 1918. On the home front, Wilson raised income taxes, set up the War Industries Board, promoted labor union cooperation, regulated agriculture and food production through the Lever Act, and nationalized the nation's railroad system. In his 1915 State of the Union, Wilson asked Congress for what became the Espionage Act of 1917 and the Sedition Act of 1918, suppressing anti-draft activists. The crackdown was later intensified by Attorney General A. Mitchell Palmer to include expulsion of non-citizen radicals during the First Red Scare of 1919–1920. Wilson infused morality into his internationalism, an ideology now referred to as "Wilsonian"—an activist foreign policy calling on the nation to promote global democracy. In early 1918, he issued his principles for peace, the Fourteen Points, and in 1919, following the signing of an armistice with Germany, he traveled to Paris, concluding the Treaty of Versailles. Wilson embarked on a nationwide tour to campaign for the treaty, which would have included U.S. entrance into the League of Nations, but was left incapacitated by a stroke in October 1919 and saw the treaty defeated in the Senate. Despite grave doubts about his health and mental capacity, Wilson served the remainder of his second term and unsuccessfully sought his party's nomination for a third term. In the 1920 presidential election, Republican Warren G. Harding defeated Democratic nominee James M. Cox in a landslide, and Harding succeeded Wilson in March 1921. Historians and political scientists rank Wilson as an above-average president, and his presidency was an important forerunner of modern American liberalism. However, Wilson has also been criticized for his racist views and actions. Wilson became a prominent 1912 presidential contender immediately upon his election as Governor of New Jersey in 1910, and his clashes with state party bosses enhanced his reputation with the rising Progressive movement. Prior to the 1912 Democratic National Convention, Wilson made a special effort to win the approval of three-time Democratic presidential nominee William Jennings Bryan, whose followers had largely dominated the Democratic Party since the 1896 presidential election. Speaker of the House Champ Clark of Missouri was viewed by many as the front-runner for the nomination, while House Majority Leader Oscar Underwood of Alabama also loomed as a challenger. Clark found support among the Bryan wing of the party, while Underwood appealed to the conservative Bourbon Democrats, especially in the South. On the first ballot of the Democratic National Convention, Clark won a plurality of delegates, and on the tenth ballot, he won a majority of the delegates after the New York Tammany Hall machine swung behind him. However, the Democratic Party required a nominee to win two-thirds of the delegates to win the nomination, and balloting continued. The Wilson campaign picked up delegates by promising the vice presidency to Governor Thomas R. Marshall of Indiana, and several Southern delegations shifted their support from Underwood to Wilson, a native Southerner. Wilson finally won two-thirds of the vote on the convention's 46th ballot, and Marshall became Wilson's running mate. Wilson faced two major opponents in the 1912 general election: one-term Republican incumbent William Howard Taft, and former Republican President Theodore Roosevelt, who ran a third party campaign as the "Bull Moose" Party nominee. A fourth candidate, Eugene V. Debs of the Socialist Party, would also win a significant share of the popular vote. Roosevelt had broken with his former party at the 1912 Republican National Convention after Taft narrowly won re-nomination, and the split in the Republican Party made Democrats hopeful that they could win the presidency for the first time since the 1892 presidential election. Roosevelt emerged as Wilson's main challenger, and Wilson and Roosevelt largely campaigned against each other despite sharing similarly progressive platforms that called for a strong, interventionist central government. Wilson won 435 of the 531 electoral votes and 41.8% of the popular vote, while Roosevelt won most of the remaining electoral votes and 27.4% of the popular vote, representing one of the strongest third party performances in U.S. history. 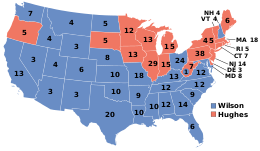 Taft won 23.2% of the popular vote but just 8 electoral votes, while Debs won 6% of the popular vote. In the concurrent congressional elections, Democrats retained control of the House and won a majority in the Senate. Wilson's victory made him the first Southerner to win the presidency since the Civil War. After the election, Wilson quickly chose William Jennings Bryan as Secretary of State, and Bryan offered advice on the remaining members of Wilson's cabinet. William Gibbs McAdoo, a prominent Wilson supporter who would marry Wilson's daughter in 1914, became Secretary of the Treasury, while James Clark McReynolds, who had successfully prosecuted prominent anti-trust cases, was chosen as Attorney General. On the advice of Underwood, Wilson appointed Texas Congressman Albert S. Burleson as Postmaster General. Bryan resigned in 1915 due to his opposition to Wilson hard line's towards Germany in the aftermath of the Sinking of the RMS Lusitania. Bryan was replaced by Robert Lansing, and Wilson took more direct control of his administration's foreign policy after Bryan's departure. Newton D. Baker, a progressive Democrat, became Secretary of War in 1916, and Baker led the War Department during World War I. Wilson's cabinet experienced turnover after the conclusion of World War I, with Carter Glass replacing McAdoo as Secretary of the Treasury and A. Mitchell Palmer becoming Attorney General. Wilson's chief of staff ("Secretary") was Joseph Patrick Tumulty from 1913 to 1921. Tumulty's position provided a political buffer and intermediary with the press, and his irrepressible spirit offset the president's often dour disposition. Wilson's first wife, Ellen Axson Wilson died on August 6, 1914. Wilson married Edith Bolling Galt in 1915, and she assumed full control of Wilson's schedule, diminishing Tumulty's power. The most important foreign policy advisor and confidant was "Colonel" Edward M. House until Wilson broke with him in early 1919, for his missteps at the peace conference in Wilson's absence. Wilson's vice president, former Governor Thomas R. Marshall of Indiana, played little role in the administration. Wilson fervently believe that public opinion ought to shape national policy, albeit with a few exceptions involving delicate diplomacy, and he paid close attention to newspapers. Press secretary Joseph Patrick Tumulty proved generally effective, until Wilson's second wife began to distrust him and reduced his influence. Wilson pioneered twice-weekly press conferences in the White House. They were modestly effective, though the president prohibited his being quoted and often made purposely vague statements. The first such press conference was held on March 15, 1913, when reporters were allowed to ask him questions. Wilson had a mixed record with the press. Relations were generally smooth, but he ended weekly meetings with the White House correspondents after the Lusitania sinking in 1915. He also sharply restricted access during the 1919 peace conference. In both cases, Wilson was afraid that publicity would interfere with his quiet diplomacy. Journalists such as Walter Lippmann found a workaround, discovering that Colonel House was both highly talkative and devious in manipulating the press to slant its stories. A major problem facing the administration was that 90 percent of the major newspapers and magazine outside the South had traditionally favored Republicans. The administration countered this by quietly collaborating with favorable reporters who admired Wilson's leadership in the cause of world peace; their newspapers printed their reports because their scoops made news. The German language press was vehemently hostile to Wilson, but he used this to his advantage, attacking hyphenates as loyal to a foreign country. Wilson appointed three individuals to the United States Supreme Court while president. He appointed James Clark McReynolds in 1914; McReynolds would serve until 1941, becoming a member of the conservative bloc of the court. In 1916, Wilson nominated Louis Brandeis to the court, setting off a major debate in the Senate over Brandeis's progressive ideology and his religion; Brandeis was the first Jewish nominee to the Supreme Court. Ultimately, Wilson was able to convince Senate Democrats to vote for Brandeis, and Brandeis would serve until 1939. Another vacancy arose in 1916 after the resignation of Charles Evans Hughes, and Wilson appointed John Hessin Clarke, a progressive lawyer from the electorally-important state of Ohio, to replace Hughes. Clarke would resign from the court in 1922. In addition to his three Supreme Court appointments, Wilson also appointed 20 judges to the United States Courts of Appeals and 52 judges to the United States district courts. With the support of the Democratic Congress, Wilson introduced a comprehensive program of domestic legislation at the outset of his administration, something no president had ever done before. Upon taking office, Wilson had four major priorities: the conservation of natural resources, banking reform, tariff reduction, and equal access to raw materials, which would be accomplished in part through the regulation of trusts. Though foreign affairs would increasingly dominate his presidency starting in 1915, Wilson's first two years in office largely focused on domestic policy, and Wilson found success in implementing much of his ambitious "New Freedom" agenda. Democrats had long seen high tariff rates as equivalent to unfair taxes on consumers, and tariff reduction was President Wilson's first priority. He argued that the system of high tariffs "cuts us off from our proper part in the commerce of the world, violates the just principles of taxation, and makes the government a facile instrument in the hands of private interests." While most Democrats were united behind a decrease in tariff rates, most Republicans held that high tariff rates were useful for protecting domestic manufacturing and factory workers against foreign competition. Shortly before Wilson took office, the Sixteenth Amendment, which had been proposed by Congress in 1909 during a debate over tariff legislation, was ratified by the requisite number of states. Following the ratification of the Sixteenth Amendment, Democratic leaders agreed to attach an income tax provision to their tariff reduction bill, partly to make up for lost revenue, and partly to shift the burden of funding the government towards the high earners that would be subject to the income tax. By late May 1913, House Majority Leader Oscar Underwood had passed a bill in the House that cut the average tariff rate by 10 percent. Underwood's bill, which represented the largest downward revision of the tariff since the Civil War, aggressively cut rates for raw materials, goods deemed to be "necessities," and products produced domestically by trusts, but it retained higher tariff rates for luxury goods. The bill also instituted a tax on personal income above $4,000. Passage of Underwood's tariff bill in the Senate would prove more difficult than in the House, partially because some Southern and Western Democrats favored the continued protection of the wool and sugar industries, and partially because Democrats had a narrower majority in that chamber. Seeking to marshal support for the tariff bill, Wilson met extensively with Democratic senators and appealed directly to the people through the press. After weeks of hearings and debate, Wilson and Secretary of State Bryan managed to unite Senate Democrats behind the bill. The Senate voted 44 to 37 in favor of the bill, with only one Democrat voting against it and only one Republican, progressive leader Robert M. La Follette Sr., voting for it. Wilson signed the Revenue Act of 1913 (also known as the Underwood Tariff) into law on October 3, 1913. The Revenue Act of 1913 reduced the average import tariff rates from approximately 40 percent to approximately 26 percent. It also restored a federal income tax for the first time since 1872 (the federal government had also adopted an income tax in the 1890s, but that tax had been struck down by the Supreme Court before taking effect). The Revenue Act of 1913 imposed a one percent tax on incomes above $3,000, with a top tax rate of six percent on those earning more than $500,000 per year. Approximately three percent of the population was subject to the income tax. The bill also included a one percent tax on the net income of all corporations, superseding a previous federal tax that had only applied to corporate net incomes above $5,000. The Supreme Court upheld the constitutionality of the income tax in the cases of Brushaber v. Union Pacific Railroad Co. and Stanton v. Baltic Mining Co. Facing the need for further revenue due to an arms build-up, in 1916 the Wilson administration called for the passage of another major revenue bill. Wilson and congressional allies like Congressman Claude Kitchin rejected proposal to increase tariff rates, instead favoring increased taxes on high earners. Working with progressive Republicans, Congressional Democrats won passage of the Revenue Act of 1916, which reinstated the federal estate tax, established a tax on the production of munitions, raised the top income tax rate to fifteen percent, and raised the corporate income tax from one percent to two percent. That same year, Wilson signed a law that established the Tariff Commission, which was charged with providing expert advice on tariff rates. In the 1920s, Republicans raised tariffs and lowered the income tax. Nonetheless, the policies of the Wilson administration had a durable impact on the composition of government revenue, which after the 1920s would primarily come from taxation rather than tariffs. Wilson did not wait to complete the Revenue Act of 1913 before proceeding to the next item on his agenda—banking. By the time Wilson took office, countries like Britain and Germany had established government-run central banks, but the United States had not had a central bank since the Bank War of the 1830s. In the aftermath of the Panic of 1907, there was general agreement among leaders in both parties of the necessity to create some sort of central banking system to provide coordination during financial emergencies. Most leaders also sought currency reform, as they believed that the roughly $3.8 billion in coins and banknotes did not provide an adequate money supply during financial panics. Under conservative Republican Senator Nelson Aldrich's leadership, the National Monetary Commission had put forward a plan to establish a central banking system that would issue currency and provide oversight and loans to the nation's banks. However, many progressives distrusted the plan due to the degree of influence bankers would have over the central banking system. Relying heavily on the advice of Louis Brandeis, Wilson sought a middle ground between progressives such as Bryan and conservative Republicans like Aldrich. He declared that the banking system must be "public not private, [and] must be vested in the government itself so that the banks must be the instruments, not the masters, of business." Democratic Congressmen Carter Glass and Robert L. Owen crafted a compromise plan in which private banks would control twelve regional Federal Reserve Banks, but a controlling interest in the system was placed in a central board filled with presidential appointees. The system of twelve regional banks was designed with the goal of diminishing Wall Street's influence. Wilson convinced Bryan's supporters that the plan met their demands for an elastic currency because Federal Reserve notes would be obligations of the government. The bill passed the House in September 1913, but it faced stronger opposition in the Senate. After Wilson convinced just enough Democrats to defeat an amendment put forth by bank president Frank A. Vanderlip that would have given private banks greater control over the central banking system, the Senate voted 54–34 to approve the Federal Reserve Act. Wilson signed the bill into law in December 1913. Wilson appointed Paul Warburg and other prominent bankers to direct the new system. While power was supposed to be decentralized, the New York branch dominated the Federal Reserve as the "first among equals." The new system began operations in 1915, and it played an important role in financing the Allied and American war effort in World War I. Having passed major legislation lowering the tariff and reforming the banking structure, Wilson next sought anti-trust legislation to supplant the Sherman Antitrust Act of 1890. The Sherman Antitrust Act had barred any "contract, combination...or conspiracy, in restraint of trade," but had proved ineffective in preventing the rise of large business combinations known as trusts. Roosevelt and Taft had both escalated antitrust prosecution by the Justice Department, but many progressives desired legislation that would do more to prevent trusts from dominating the economy. While Roosevelt believed that trusts could be separated into "good trusts" and "bad trusts" based on their effects on the broader economy, Wilson had argued for breaking up all trusts during his 1912 presidential campaign. In December 1913, Wilson asked Congress to pass an anti-trust law that would ban many anti-competitive practices. A month later, in January 1914, he also asked for the creation of an interstate trade commission, eventually known as the Federal Trade Commission (FTC), that would preside over the dissolution of trusts but would play no role in anti-trust prosecution itself. With Wilson's support, Congressman Henry Clayton, Jr. introduced a bill that would ban several anti-competitive practices such discriminatory pricing, tying, exclusive dealing, and interlocking directorates. The bill also allowed individuals to launch anti-trust suits, and it limited the applicability of anti-trust laws on unions. As the difficulty of banning all anti-competitive practices via legislation became clear, Wilson came to favor legislation granting the FTC greater discretion to investigate anti-trust violations and enforce anti-trust laws independently of the Justice Department. The Federal Trade Commission Act of 1914, which incorporated Wilson's ideas regarding the FTC, passed Congress with bipartisan support, and Wilson signed the bill into law in September 1914. One month later, Wilson signed the Clayton Antitrust Act of 1914, which built on the Sherman Act by defining and banning several anti-competitive practices. President Taft had established the Commission on Industrial Relations to study labor issues, but the Senate had rejected all of his nominees to the commission. Upon taking office, Wilson nominated a mix of conservatives and progressive reformers, with commission chairman Frank P. Walsh falling into the latter group. The commission helped expose numerous labor abuses throughout the nation, and Walsh proposed reforms designed to empower unions. Prior to his first presidential inauguration, Wilson had had an uneasy relationship with union leaders such as Samuel Gompers of the American Federation of Labor, and he generally believed that workers were best protected through laws rather than unions. Wilson and Secretary of Labor William Bauchop Wilson rejected Walsh's proposed reforms, and instead focused on using the Labor Department to mediate conflicts between labor and ownership. The labor policies of Wilson's administration were tested by a strike against the Colorado Fuel and Iron Company in late 1913 and early 1914. The company rejected the Labor Department's attempts to mediate, and a militia controlled by the company attacked a miner's camp in what became known as the Ludlow Massacre. At the Governor of Colorado's request, the Wilson administration sent in troops to end the dispute, but mediation efforts failed after the union called off the strike due to a lack of funds. In mid-1916, a major railroad strike endangered the nation's economy. The president called the parties to a White House summit in August — after two days and no results, Wilson proceeded to settle the issue, using the maximum eight-hour work day as its linchpin. Congress passed the Adamson Act, which incorporating the president's proposed eight-hour work day. As a result, the strike was then cancelled. Wilson was praised for averting a national economic disaster, even though the law was received with howls from conservatives, who denounced it as a sellout to the unions and a surrender by Congress to an imperious president. The Adamson Act was the first federal law that regulated hours worked by private employees. In 1916, Wilson signed the Keating–Owen Act, which banned child labor. The act was struck down by the Supreme Court in the 1918 case of Hammer v. Dagenhart. Wilson's agricultural policies were heavily influenced by Walter Hines Page, who favored a reorganization of the U.S. Department of Agriculture to put less focus on scientific research and more emphasis on using the department to provide education and other services directly to farmers. Secretary of Agriculture David F. Houston presided over the implementation of many of Page's proposed reforms and worked with Congressman Asbury Francis Lever to introduce the bill that became the Smith–Lever Act of 1914. This act established government subsidies for a demonstration farming program allowing farmers to voluntarily experiment with farming techniques favored by agricultural experts. Proponents of the Smith–Lever Act overcame many conservatives' objections by adding provisions to bolster local control of the program. Local agricultural colleges supervised the agricultural extension agents, and the agents were barred from operating without county governments' approval. By 1924, three-quarters of the agriculture-oriented counties in the United States took part in the agricultural extension program. Wilson also helped ensure passage of the Federal Farm Loan Act, which created twelve regional banks empowered to provide low-interest loans to farmers. Wilson embraced the long-standing Democratic policy against owning colonies, and he worked for the gradual autonomy and ultimate independence of the Philippines, which had been acquired from Spain in the Spanish–American War. Wilson increased self-governance on the islands by granting Filipinos greater control over the Philippine Legislature. The House passed a measure to grant the Philippines full independence, but Republicans blocked this proposal in the Senate. The Jones Act of 1916 committed the United States to the eventual independence of the Philippines; independence took place in 1946. The Jones Act of 1917 upgraded the status of Puerto Rico, which had also been acquired from Spain in 1898. The act, which superseded the Foraker Act, created the Senate of Puerto Rico, established a bill of rights, and authorized the election of a Resident Commissioner (previously appointed by the president) to a four-year term. The act also granted Puerto Ricans U.S. citizenship and exempted Puerto Rican bonds from federal, state, and local taxes. Immigration was a high priority topic in American politics during Wilson's presidency, but he gave the matter little attention. Wilson's progressivism encouraged his belief that immigrants from Southern and Eastern Europe, though poor and illiterate, could assimilate into a homogeneous white middle class, and he opposed the restrictive immigration policies that many members of both parties favored. However, the so-called "hyphenated" Irish and German elements repulsed him because he believed that they were motivated to help the wartime needs of Ireland and Germany, not to the needs and values of the United States. In 1913, California enacted the California Alien Land Law of 1913 to exclude Japanese non-citizens from owning any land in the state. The Japanese government protested strongly, and Wilson sent Secretary of State Bryan to California. Bryan was unable to get California to relax the restrictions, and Wilson accepted the law even though it violated a 1911 treaty with Japan. The law bred resentment in Japan which would linger into the 1920s and 1930s. High rates of immigration suddenly ended in 1914, as European nations closed their borders during World War I. Wilson vetoed the Immigration Act of 1917, but Congress overrode the veto. The act's goal was to reduce unskilled immigration Europe by requiring literacy tests. It was the first U.S. law to restrict immigration from Europe, and it foreshadowed the more restrictive immigration laws of the 1920s. With the American entrance into World War I in April 1917, Wilson became a war-time president. The War Industries Board, headed by Bernard Baruch, was established to set U.S. war manufacturing policies and goals. 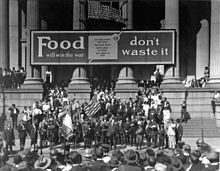 Future President Herbert Hoover led the Food Administration; the Federal Fuel Administration, run by Henry Garfield, introduced daylight saving time and rationed fuel supplies; William McAdoo was in charge of war bond efforts; Vance McCormick headed the War Trade Board. These men, known collectively as the "war cabinet", met weekly with Wilson at the White House. Because he was heavily focused on foreign policy during World War I, Wilson delegated a large degree of authority over the home front to his subordinates. The great majority of unions, including the AFL and the railroad brotherhoods, supported the war effort, and were rewarded for their efforts with high pay and access to Wilson. Unions saw enormous growth in membership and wages during the war, and strikes were rare. Wilson established the National War Labor Board (NWLB) to mediate wartime labor disputes, but it was slow to organize, and the Labor Department provided mediation services in most disputes. Wilson's labor policies continued to stress mediation and agreement on all sides. When Smith & Wesson refused to assent to an NWLB ruling, the War Department seized control of the gun company and forced employees to return to work. In the midst of the war, the federal budget soared from $1 billion in fiscal year 1916 to $19 billion in fiscal year 1919. In addition to spending on its own military build-up, the United States provided large loans to the Allied countries, helping to prevent the economic collapse of Britain and France. By the end of the war, the United States had become a creditor nation for the first time in its history. Seeking to avoid the high levels of inflation that had accompanied the heavy borrowing of the American Civil War, the Wilson administration sought to further increase taxes during the war. The War Revenue Act of 1917 raised the top tax rate to 67 percent, greatly increased the number of Americans paying the income tax (approximately 5.5 million Americans would pay the income tax in 1920), and levied an excess profits tax on businesses and individuals. The Revenue Act of 1918 raised the top tax rate to 77 percent and further increased other taxes. Despite these tax acts, the United States was forced to borrow heavily to finance the war effort. Treasury Secretary McAdoo authorized the issuing of low-interest war bonds and, to attract investors, made interest on the bonds tax-free. The bonds proved so popular among investors that many borrowed money in order to buy more bonds. The purchase of bonds, along with other war-time pressures, resulted in rising inflation. However, this inflation was partly matched by rising wages and profits, as farmers, laborers, and business owners benefited from the stimulative effect of government spending. Wilson established the first modern propaganda office, the Committee on Public Information (CPI), headed by George Creel. Creel set out to systematically reach every person in the United States multiple times with patriotic information about how the individual could contribute to the war effort. He set up divisions in his new agency to produce and distribute innumerable copies of posters, pamphlets, newspaper releases, magazine advertisements, films, school campaigns, and the speeches of the Four Minute Men. The CPI also worked with the Post Office to censor seditious counter-propaganda. The CPI trained thousands of volunteer speakers to make patriotic appeals during the four-minute breaks needed to change reels at movie theaters. CPI volunteers also spoke at churches, lodges, fraternal organizations, labor unions, and even logging camps. Creel boasted that in 18 months his 75,000 volunteers delivered over 7.5 million four minute orations to over 300 million listeners, in a nation of 103 million people. To counter disloyalty to the war effort at home, Wilson pushed through Congress the Espionage Act of 1917 and the Sedition Act of 1918 to suppress anti-British, pro-German, or anti-war statements. While he welcomed socialists who supported the war, he pushed at the same time to arrest and deport foreign-born enemies. Many recent immigrants, resident aliens without U.S. citizenship, who opposed America's participation in the war were deported to Soviet Russia or other nations under the powers granted in the Immigration Act of 1918. Because of the lack of a national police force, the Wilson administration relied heavily on state and local police forces, as well as voluntary compliance, to enforce war-time laws. Anarchists, communists, Industrial Workers of the World members, and other antiwar groups attempting to sabotage the war effort were targeted by the Department of Justice; many of their leaders were arrested for incitement to violence, espionage, or sedition. Eugene Debs, the 1912 Socialist presidential candidate, was among the most prominent individuals jailed for sedition. In response to concerns over civil liberties, the American Civil Liberties Union (ACLU), a private organization devoted to the defense of free speech, was founded in 1917. Prohibition developed as an unstoppable reform during the war, but Wilson played a only minor role in its passage. A combination of the temperance movement, hatred of everything German (including beer and saloons), and activism by churches and women led to ratification of an amendment to achieve Prohibition in the United States. A Constitutional amendment passed both houses in December 1917 by 2/3 votes. By January 16, 1919, the Eighteenth Amendment had been ratified by 36 of the 48 states it needed. On October 28, 1919, Congress passed enabling legislation, the Volstead Act, to enforce the Eighteenth Amendment. Wilson felt Prohibition was unenforceable, but his veto of the Volstead Act was overridden by Congress. Prohibition began on January 16, 1920; the manufacture, importation, sale, and transport of alcohol were prohibited, except in specific cases (such as wine used for religious purposes). Wilson personally favored women's suffrage, but said it was a state matter, partly because of strong opposition in the South to any constitutional amendment. A win for suffrage in New York state, combined with the increasingly prominent role women took in the war effort in factories and at home, convinced Wilson and many others to fully support women's suffrage. In a January 1918 speech before Congress, Wilson for the first time endorsed a national right to vote: "We have made partners of the women in this war....Shall we admit them only to a partnership of suffering and sacrifice and toil and not to a partnership of privilege and right?" Later in January, the House quickly passed a constitutional amendment providing for women's suffrage in a 274 to 136 vote, but the campaign for women's suffrage stalled in the Senate. While the vast majority of Republicans favored the amendment, most Southern Democrats opposed it. Wilson continually pressured senators to vote for the bill, and in June 1919 the Senate approved the amendment. The requisite number of states ratified the Nineteenth Amendment in August 1920. hat same year, Wilson appointed Helen H. Gardener to a seat on the United States Civil Service Commission, the highest position a woman had ever held in the federal government. Wilson's leadership in domestic policy in the aftermath of the war was complicated by his focus on the Treaty of Versailles, opposition from the Republican-controlled Congress, and, beginning late 1919, Wilson's illness. A plan to form a commission for the purpose of demobilization of the war effort was abandoned due to the Republican control of the Senate, as Republicans could block the appointment of commission members. Instead, Wilson favored the prompt dismantling of wartime boards and regulatory agencies. Though McAdoo and others favored extending government control of railroads under the United States Railroad Administration, Wilson signed the Esch–Cummins Act, which restored private control in 1920. Demobilization was chaotic and violent; four million soldiers were sent home with little planning, little money, few benefits, and other vague promises. A wartime bubble in prices of farmland burst, leaving many farmers deeply in debt after they purchased new land. Major strikes in the steel, coal, and meatpacking industries disrupted the economy in 1919. The country was also hit by the 1918 flu pandemic, which killed over 600,000 Americans in 1918 and 1919. A massive agricultural price collapse was averted in 1919 in early 1920 through the efforts of Hoover's Food Administration, but prices dropped substantially in late 1920. After the expiration of wartime contracts in 1920, the U.S. plunged into a severe recession, and unemployment rose to 11.9%. Following the October Revolution in the Russian Empire, many in America feared the possibility of a Communist-inspired revolution in the United States. These fears were inflamed by the 1919 United States anarchist bombings, which were conducted by the anarchist Luigi Galleani and his followers. Fears over left-wing subversion, combined with a patriotic national mood, led to the outbreak of the so-called "First Red Scare." Attorney General A. Mitchell Palmer convinced Wilson to delay amnesty for those who had been convicted of war-time sedition, and he launched the Palmer Raids to suppress radical organizations. Palmer's activities met resistance from the courts and from some senior officials in the Wilson administration, but Wilson, who was physically incapacitated by late 1919, did not move to stop the raids. Palmer warned of a massive 1920 May Day uprising, but after the day passed by without incident, the Red Scare largely dissipated. Historian Kendrick Clements argues that "Wilson had none of the crude, vicious racism of James K. Vardaman or Benjamin R. Tillman, but he was insensitive to African-American feelings and aspirations." Segregation of government offices and discriminatory hiring practices had been started by President Theodore Roosevelt and continued by President Taft, but the Wilson administration escalated the practice. In Wilson's first month in office, Postmaster General Albert S. Burleson brought up the issue of segregating workplaces in a cabinet meeting and urged the president to establish it across the government, in restrooms, cafeterias and work spaces. Treasury Secretary William G. McAdoo also permitted lower-level officials to racially segregate employees in the workplaces of those departments. Though Wilson did not issue an executive order regarding segregation, by the end of 1913 many departments, including the Navy, had segregated workspaces, restrooms, and cafeterias were segregated. During Wilson's term, the government also began requiring photographs of all applicants for federal jobs. Ross Kennedy writes that Wilson's support of segregation complied with predominant public opinion, but his change in federal practices was protested in letters from both blacks and whites to the White House, mass meetings, newspaper campaigns and official statements by both black and white church groups. The president's African-American supporters, who had crossed party lines to vote for him in 1912, were bitterly disappointed, and they and Northern leaders protested the changes. Wilson defended his administration's segregation policy in a July 1913 letter responding to Oswald Garrison Villard, publisher of the New York Evening Post and founding member of the NAACP; Wilson suggested the segregation removed "friction" between the races. After the United States entered World War I, the War Department drafted hundreds of thousands of blacks into the army, giving them equal pay with whites. However, in accord with military policy from the Civil War through the Second World War, the army kept African-American soldiers in all-black units with white officers, and the great majority of black units were kept out of combat. When a delegation of blacks protested the discriminatory actions, Wilson told them "segregation is not a humiliation but a benefit, and ought to be so regarded by you gentlemen." In 1918, W. E. B. Du Bois—a leader of the NAACP who had campaigned for Wilson believing he was a "liberal southerner"—was offered an army commission in charge of dealing with race relations; DuBois accepted, but he failed his army physical and did not serve. By 1916, Du Bois opposed Wilson, charging that his first term had seen "the worst attempt at Jim Crow legislation and discrimination in civil service that [blacks] had experienced since the Civil War." 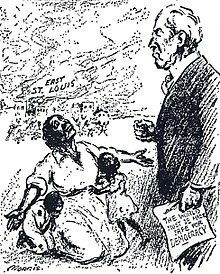 Editorial cartoon by William Charles Morris in New York Evening Mail about the East St. Louis riot of 1917. The caption reads, "Mr. President, why not make America safe for democracy? ", referring to Wilson's war message, "The world must be made safe for democracy." The Great Migration of African Americans out of the South surged in 1917 and 1918. There was a severe shortage of housing in centers of war industry. Race riots erupted--the worst was the East St. Louis riots of July 1917 which killed 29 blacks and 9 whites and caused $1.4 million in property damage. Wilson asked Attorney General Thomas Watt Gregory if the federal government could intervene to "check these disgraceful outrages." However, on the advice of Gregory, Wilson did not take direct action against the riots. In 1919, another series of race riots occurred in Chicago, Omaha, and two dozen other major cities in the North. The federal government did not become involved. consistently condemned militarism, imperialism, and interventionism in foreign policy. They instead advocated world involvement along liberal-internationalist lines. Wilson's appointment of William Jennings Bryan as Secretary of State indicated a new departure, for Bryan had long been the leading opponent of imperialism and militarism and a pioneer in the world peace movement. Bryan took the initiative in asking 40 countries with ambassadors in Washington to sign bilateral arbitration treaties. Any dispute of any kind with the United States would lead to a one-year cooling-off period, and submission to an international commission for arbitration. Thirty countries signed, but not Mexico and Colombia (which had grievances with Washington), nor Japan, Germany, Austria-Hungary, or the Ottoman Empire. Some European diplomats signed the treaties, but considered them irrelevant. Wilson's genuine and deeply felt aspirations to build a better world suffered from a certain culture-blindness. He lacked experience in diplomacy and hence an appreciation of its limits. He had not traveled widely outside the United States and knew little of other peoples and cultures beyond Britain, which he greatly admired. Especially in his first years in office, he had difficulty seeing that well-intended efforts to spread U.S. values might be viewed as interference at best, coercion at worst. His vision was further narrowed by the terrible burden of racism, common among the elite of his generation, which limited his capacity to understand and respect people of different colors. Above all, he was blinded by his certainty of America's goodness and destiny. Wilson sought closer relations with Latin America, and he hoped to create a Pan-American organization to arbitrate international disputes. He also negotiated a treaty with Colombia that would have paid that country an indemnity for the U.S. role in the secession of Panama, but the Senate defeated this treaty. However, Wilson frequently intervened in Latin American affairs, saying in 1913: "I am going to teach the South American republics to elect good men." The Dominican Republic had been a de facto American protectorate since Roosevelt's presidency, but suffered from instability. In 1916, Wilson sent troops to occupy the island, and the U.S. soldiers would remain until 1924. In 1915, the U.S. intervened in Haiti after a revolt overthrew the Haitian government, beginning an occupation that would last until 1919. Wilson also authorized military interventions in Cuba, Panama, and Honduras. The 1914 Bryan–Chamorro Treaty converted Nicaragua into another de facto protectorate, and the U.S. stationed soldiers there throughout Wilson's presidency. The Panama Canal opened in 1914, fulfilling the long-term American goal of building a canal across Central America. The canal provided quick passage between the Pacific Ocean with the Atlantic Ocean, presenting new opportunities to the shippers and allowing the Navy to quickly transfer warships between the two oceans. In 1916, Wilson used the Treaty of the Danish West Indies to purchase the Danish West Indies for $25 million. The new territory was renamed as the United States Virgin Islands. Wilson took office during the Mexican Revolution, which had begun in 1911 after liberals overthrew the military dictatorship of Porfirio Díaz. Shortly before Wilson took office, conservatives retook power through a coup led by Victoriano Huerta. Wilson rejected the legitimacy of Huerta's "government of butchers" and demanded Mexico hold democratic elections. Wilson's unprecedented approach meant no recognition and doomed Huerta's prospects for establishing a stable government. After Huerta arrested U.S. Navy personnel who had accidentally landed in a restricted zone near the northern port town of Tampico, Wilson dispatched the Navy to occupy the Mexican city of Veracruz. A strong backlash against the American intervention among Mexicans of all political affiliations convinced Wilson to abandon his plans to expand the U.S. military intervention, but the intervention nonetheless helped convince Huerta to flee from the country. A group led by Venustiano Carranza established control over a significant proportion of Mexico, and Wilson recognized Carranza's government in October 1915. Carranza continued to face various opponents within Mexico, including Pancho Villa, whom Wilson had earlier described as "a sort of Robin Hood." In early 1916, Pancho Villa raided an American town in New Mexico, killing or wounding dozens of Americans and causing an enormous nationwide American demand for his punishment. Wilson ordered General John J. Pershing and 4000 troops across the border to capture Villa. 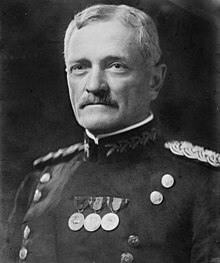 By April, Pershing's forces had broken up and dispersed Villas bands, but Villa remained on the loose and Pershing continued his pursuit deep into Mexico. Carranza then pivoted against the Americans and accused them of a punitive invasion; a confrontation with a mob in Parral on April 12 resulted in two dead Americans and six wounded, plus hundreds of Mexican casualties. Further incidents led to the brink of war by late June, when Wilson demanded an immediate release of American soldiers held prisoner. The prisoners were released, tensions subsided, and bilateral negotiations began under the auspices of the Mexican-American Joint High Commission. Eager to withdraw from Mexico due to World War I, Wilson ordered Pershing to withdraw, and the last American soldiers left in February 1917. According to historian Arthur Link, Carranza's successful handling of the American intervention in Mexico left the country free to develop its revolution without American pressure. The incident also gave the American army some needed experience and made Pershing a national figure. World War I broke out in July 1914, pitting the Central Powers (Germany, Austria-Hungary, the Ottoman Empire, and Bulgaria) against the Allied Powers (Great Britain, France, Russia, and several other countries). The war fell into a long stalemate after the German advance was halted in September 1914 at the First Battle of the Marne. From 1914 until early 1917, Wilson's primary foreign policy objective was to keep the United States out of the war in Europe. Wilson insisted that all government actions be neutral, and that the belligerents must respect that neutrality according to the norms of international law. After the war began, Wilson told the Senate that the United States, "must be impartial in thought as well as in action, must put a curb upon our sentiments as well as upon every transaction that might be construed as a preference of one party to the struggle before another." He was ambiguous whether he meant the United States as a nation or meant all Americans as individuals. Though Wilson was determined to keep the United States out of the war, and he thought that the causes of the war were complex, he personally believed that the U.S. shared more values with the Allies than the Central Powers. Wilson and House sought to position the United States as a mediator in the conflict, but European leaders rejected Houses's offers to help end the conflict. At the urging of Bryan, Wilson also discouraged American companies from extending loans to belligerents. The policy hurt the Allies more than the Central Powers, since the Allies were more dependent on American goods. The administration relaxed the policy of discouraging loans in October 1914 and then ended it in October 1915 due to fears about the policy's effect on the American economy. The United States sought to trade with both the Allied Powers and the Central Powers, but the British attempted to impose a Blockade of Germany, and, after a period of negotiations, Wilson essentially assented to the British blockade. The U.S. had relatively little direct trade with the Central Powers, and Wilson was unwilling to wage war against Britain over trade issues. The British also made their blockade more acceptable to American leaders by buying, rather than seizing without compensation, intercepted goods. Many Germans viewed American trade with the Allies as decidedly unneutral. In response to the British blockade of the Central Powers, the Germans launched a submarine campaign against merchant vessels in the seas surrounding the British Isles. Wilson strongly protested the policy, which had a much stronger affect on American trade than the British blockade. In the March 1915 Thrasher Incident, the commercial British steamship Falaba was sunk by a German submarine with the loss of 111 lives, including one American. In early 1915, a German bomb struck an American ship, the Cushing, and a German submarine torpedoed an American tanker, the Gulflight. Wilson took the view, based on some reasonable evidence, that both incidents were accidental, and that a settlement of claims could be postponed to the end of the war. A German submarine torpedoed and sank the British ocean liner RMS Lusitania in May 1915; over a thousand perished, including many Americans. Wilson did not call for war; instead he said, "There is such a thing as a man being too proud to fight. There is such a thing as a nation being so right that it does not need to convince others by force that it is right". He realized he had chosen the wrong words when critics lashed out at his rhetoric. Wilson sent a protest to Germany which demanded that the German government "take immediate steps to prevent the recurrence" of incidents like the sinking of the Lusitania. In response, Bryan, who believed that Wilson had placed the defense of American trade rights above neutrality, resigned from the cabinet. The White Star liner the SS Arabic was torpedoed in August 1915, with two American casualties. The U.S. threatened a diplomatic break unless Germany repudiated the action. The Germans agreed to warn unarmed merchant ships before attacking them. In March 1916, the SS Sussex, an unarmed ferry under the French flag, was torpedoed in the English Channel and four Americans were counted among the dead; the Germans had flouted the post-Lusitania exchanges. Wilson drew praise when he succeeded in wringing from Germany a pledge to constrain submarine warfare to the rules of cruiser warfare. This was a clear departure from existing practices—a diplomatic concession from which Germany could only more brazenly withdraw. In January 1917, the Germans initiated a new policy of unrestricted submarine warfare against ships in the seas around the British Isles. German leaders knew that the policy would likely provoke U.S. entrance into the war, but they hoped to defeat the Allied Powers before the U.S. could fully mobilize. Wilson's long silence about preparedness had permitted such a spread and such a hardening of antipreparedness attitudes within his party and across the nation that when he came in at late last to his task, neither Congress to the country was amenable to much persuasion. After the sinking of the Lusitania and the resignation of Bryan, Wilson publicly committed himself to preparedness and began to build up the army and the navy. Wilson was constrained by America's traditional commitment to military nonintervention. Wilson believed that a massive military mobilization could only take place after a declaration of war, even though that meant a long delay in sending troops to Europe. Many Democrats felt that no American soldiers would be needed, only American money and munitions. Wilson had more success in his request for a dramatic expansion of the Navy. Congress passed a Naval Expansion Act in 1916 that encapsulated the planning by the Navy's professional officers to build a fleet of top-rank status, but it would take several years to become operational. In early 1917, German ambassador Johann von Bernstorf informed Secretary of State Lansing of Germany's commitment to unrestricted submarine warfare. In late February, the U.S. public learned of the Zimmermann Telegram, a secret diplomatic communication in which Germany sought to convince Mexico to join it in a war against the United States. Wilson's reaction after consulting the Cabinet and with Congress was a minimal one—that diplomatic relations with the Germans be brought to a halt. The president said, "We are the sincere friends of the German people and earnestly desire to remain at peace with them. We shall not believe they are hostile to us unless or until we are obliged to believe it". After a series of attacks on American ships, Wilson held a Cabinet meeting on March 20; all Cabinet members agreed that the time had come for the United States to enter the war. Wilson called Congress into a special session, which would begin on April 2. March 1917 also brought the first of two revolutions in Russia, which impacted the strategic role of the U.S. in the war. The overthrow of the imperial government removed a serious barrier to America's entry into the European conflict, while the second revolution in November relieved the Germans of a major threat on their eastern front, and allowed them to dedicate more troops to the Western front, thus making U.S. forces central to Allied success in battles of 1918. Wilson initially rebuffed pleas from the Allies to dedicate military resources to an intervention in Russia against the Bolsheviks, based partially on his experience from attempted intervention in Mexico; nevertheless he ultimately was convinced of the potential benefit and agreed to dispatch a limited force to assist the Allies on the eastern front. Wilson addressed Congress on April 2, calling for a declaration of war against Germany. He argued that the Germans were engaged in "nothing less than war against the government and people of the United States." He asked for a military draft to raise the army, increased taxes to pay for military expenses, loans to Allied governments, and increased industrial and agricultural production. 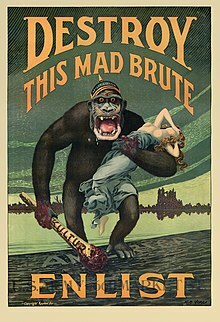 The declaration of war by the United States against Germany passed Congress by strong bipartisan majorities on April 6, 1917, with opposition from ethnic German strongholds and remote rural areas in the South. The United States would also later declare war against Austria-Hungary in December 1917. The U.S. did not sign a formal alliance with Britain or France but operated as an "associated" power—an informal ally with military cooperation through the Supreme War Council in London. Generals Frederick Funston and Leonard Wood had been contenders for the command of American army forces in Europe, but Funston died just weeks before the United States entered the war, and Wilson distrusted Wood, who was a close ally of Theodore Roosevelt. Wilson instead gave command to General John J. Pershing, who had led the expedition against Pancho Villa. Pershing would have complete authority as to tactics, strategy, and some diplomacy. Edward House became the president's main channel of communication with the British government, and William Wiseman, a British naval attaché, was House's principal contact in England. Their personal relationship succeeded in serving the powers well, by overcoming strained relations in order to achieve essential understandings between the two governments. House also became the U.S. representative on the Allies' Supreme War Council. Wilson sought the establishment of "an organized common peace" that would help prevent future conflicts. In this goal, he was opposed not just by the Central Powers, but also the other Allied Powers, who, to various degrees, sought to win concessions and oppose a punitive peace agreement on the Central Powers. He initiated a secret study group named the The Inquiry, directed by Colonel House, to prepare for post-ware negotiations. The Inquiry's studies culminated in a speech by Wilson to Congress on January 8, 1918, wherein he articulated America's long term war objectives. It was the clearest expression of intention made by any of the belligerent nations. The speech, known as the Fourteen Points, was authored mainly by Walter Lippmann and projected Wilson's progressive domestic policies into the international arena. The first six points dealt with diplomacy, freedom of the seas, and settlement of colonial claims. Then territorial issues were addressed and the final point, the establishment of an association of nations to guarantee the independence and territorial integrity of all nations—a League of Nations. The address was translated into many languages for global dissemination. Aside from post-war considerations, Wilson's Fourteen Points were motivated by several factors. Unlike some of the other Allied leaders, Wilson did not call for the total break-up of the Ottoman Empire or the Austro-Hungarian Empire. In offering a non-punitive peace to these nations as well as Germany, Wilson hoped to quickly began negotiations to end the war. Wilson's liberal pronouncements were also targeted at pacifistic and war-weary elements within the Allied countries, including the United States. Additionally, Wilson hoped to woo the Russians back into the war, although he failed in this goal. With the U.S. entrance into the war, Wilson and Secretary of War Baker launched an expansion of the army, with the goal of creating a 300,000-member Regular Army, a 440,000-member National Guard, and a 500,000-member conscripted force known as the "National Army." Despite some resistance to conscription and to the commitment of American soldiers abroad, large majorities of both houses of Congress voted to impose conscription with the Selective Service Act of 1917. Seeking to avoid the draft riots of the Civil War, the bill established local draft boards that were charged with determining who should be drafted. By the end of the war, nearly 3 million men would be drafted. The Navy also saw tremendous expansion, and, at the urging of Admiral William Sims, focused on building anti-submarine vessels. Allied shipping losses dropped substantially due to U.S. contributions and a new emphasis on the convoy system. The American Expeditionary Forces first arrived in France in mid-1917. Wilson and Pershing rejected the British and French proposal that American soldiers integrate into existing Allied units, giving the United States more freedom of action but requiring for the creation of new organizations and supply chains. There were only 175,000 American soldiers in Europe at the end of 1917, but by mid-1918 10,000 Americans were arriving in Europe per day. Russia exited the war after the March 1918 signing of the Treaty of Brest-Litovsk, allowing Germany to shift soldiers from the Eastern Front of the war. The Germans launched a Spring Offensive against the Allies that inflicted heavy casualties but failed to break the Allied line. Beginning in August, the Allies launched the Hundred Days Offensive that pushed back the exhausted German army. By the end of September 1918, the German leadership no longer believed it could win the war. Recognizing that Wilson would be more likely to accept a peace deal from a democratic government, Kaiser Wilhelm II appointed a new government led by Prince Maximilian of Baden; Baden immediately sought an armistice with Wilson. In the exchange of notes, German and American leaders agreed to incorporate the Fourteen Points in the armistice; House then procured agreement from France and Britain, but only after threatening to conclude a unilateral armistice without them. Wilson ignored Pershing's plea to drop the armistice and instead demand an unconditional surrender by Germany. The Germans signed the Armistice of 11 November 1918, bringing an end to the fighting. Austria-Hungary had signed the Armistice of Villa Giusti eight days earlier, while the Ottoman Empire had signed the Armistice of Mudros in October. After the signing of the armistice, Wilson traveled to Europe to attend the Paris Peace Conference, thereby becoming the first U.S. president to travel to Europe while in office. Save for a two-week return to the United States, Wilson remained in Europe for six months, where he focused on reaching a peace treaty to formally end the war. The defeated Central Powers had not been invited to the conference, and anxiously awaited their fate. Wilson proposed that the competing factions of the Russian Civil War declare a truce and send a joint delegation to the Paris Peace Conference, but other Allied leaders opposed the proposal and no delegation was sent. 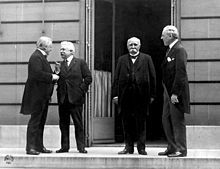 Wilson, British Prime Minister David Lloyd George, French Prime Minister Georges Clemenceau, and Italian Prime Minister Vittorio Emanuele Orlando made up the "Big Four," the Allied leaders with the most influence at the Paris Peace Conference. Though Wilson continued to advocate his idealistic Fourteen Points, many of the other allies desired revenge. Clemenceau especially sought onerous terms for Germany, while Lloyd George supported some of Wilson's ideas but feared public backlash if the treaty proved too favorable to the Central Powers. In pursuit of his League of Nations, Wilson conceded several points to the other powers present at the conference. France pressed for the dismemberment of Germany and the payment of a huge sum in war reparations. Wilson resisted these ideas, but Germany was still required to pay war reparations and subjected to military occupation in the Rhineland. Additionally, a clause in the treaty specifically named Germany as responsible for the war. Wilson agreed to the creation of mandates in former German and Ottoman territories, allowing the European powers and Japan to establish de facto colonies in the Middle East, Africa, and Asia. The Japanese acquisition of German interests in the Shandong Peninsula of China proved especially unpopular, as it undercut Wilson's promise of self-government. However, Wilson won the creation of several new states in Central Europe and the Balkans, including Poland, Yugoslavia, and Czechoslovakia, and the Austro-Hungarian Empire and the Ottoman Empire were partitioned. Wilson refused to concede to Italy's demands for territory on the Adriatic coast, leading to a dispute between Yugoslavia and Italy that would not be settled until the signing of the 1920 Treaty of Rapallo. Japan proposed that the conference endorse a racial equality clause. Wilson was indifferent to the issue, but acceded to strong opposition from Australia and Britain. The Covenant of the League of Nations was incorporated into the conference's Treaty of Versailles, which ended the war with Germany. Wilson himself presided over the committee that drafted the covenant, which bound members to oppose "external aggression" and to agree to peacefully settle disputes through organizations like the Permanent Court of International Justice. During the conference, former President Taft cabled to Wilson three proposed amendments to the League covenant which he thought would considerably increase its acceptability—the right of withdrawal from the League, the exemption of domestic issues from the League, and the inviolability of the Monroe Doctrine. Wilson very reluctantly accepted these amendments. In addition to the Treaty of Versailles, the Allies also wrote treaties with Austria (the Treaty of Saint-Germain-en-Laye), Hungary (the Treaty of Trianon), the Ottoman Empire (the Treaty of Sèvres), and Bulgaria (the Treaty of Neuilly-sur-Seine), all of which incorporated the League of Nations charter. The conference finished negotiations in May 1919, at which point German leaders viewed the treaty for the first time. Some German leaders favored repudiating the treaty, but Germany signed the treaty on June 28, 1919. For his peace-making efforts, Wilson was awarded the 1919 Nobel Peace Prize. However, the defeated Central Powers protested the harsh terms of the treaty, and several colonial representatives pointed out the hypocrisy of a treaty that established new nations in Europe but allowed continued colonialism in Asia and Africa. Wilson also faced an uncertain domestic battle to ratify the treaty, as Republicans largely opposed it. The chances were less than favorable for ratification of the treaty by a two-thirds vote of the Senate, in which Republicans held a narrow majority. Public opinion on the treaty was mixed, with intense opposition from most Republicans, Germans, and Irish Catholic Democrats. In numerous meetings with Senators, Wilson discovered opposition had hardened. Despite his weakened physical condition following the Paris Peace Conference, Wilson decided to barnstorm the Western states, scheduling 29 major speeches and many short ones to rally support. Wilson suffered a series of debilitating strokes and had to cut short his trip on in September 1919. He became an invalid in the White House, closely monitored by his wife, who insulated him from negative news and downplayed for him the gravity of his condition. Senator Henry Cabot Lodge led the opposition to the treaty; he despised Wilson and hoped to humiliate him in the ratification battle. Republicans were outraged by Wilson's failure to discuss the war or its aftermath with them. An intensely partisan battle developed in the Senate, as Republicans opposed the treaty and Democrats largely supported it. The debate over the treaty centered around a debate over the American role in the world community in the post-war era, and Senators fell into three main groups. Most Democrats favored the treaty. 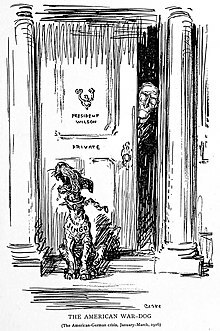 Fourteen Senators, mostly Republicans, become known as the "irreconcilables," as they completely opposed U.S. entrance into the League of Nations. Some of these irreconcilables, such as George W. Norris, opposed the treaty for its failure to support decolonization and disarmament. Other irreconcilables, such as Hiram Johnson, feared surrendering American freedom of action to an international organization. Most sought the removal of Article X the League covenant, which purported to bind nations to defend each other against aggression. The remaining group of Senators, known as "reservationists," accepted the idea of the league, but sought varying degrees of change to the League to ensure the protection of U.S. sovereignty. Former President Taft and former Secretary of State Elihu Root both favored ratification of the treaty with some modifications, and their public support for the treaty gave Wilson some chance of winning significant Republican support for ratification. Despite the difficulty of winning ratification, Wilson consistently refused to accede to reservations, partly due to concerns about having to re-open negotiations with the other powers if reservations were added. In mid-November 1919, Lodge and his Republicans formed a coalition with the pro-treaty Democrats to pass a treaty with reservations, but the seriously indisposed Wilson rejected this compromise and enough Democrats followed his lead to defeat ratification. Cooper and Bailey suggest that Wilson's stroke in September had debilitated him from negotiating effectively with Lodge. U.S. involvement in World War I would not formally end until the passage of the Knox–Porter Resolution in 1921. After Russia left World War I following the Bolshevik Revolution of 1917, the Allies sent troops there to prevent a German or Bolshevik takeover of weapons, munitions and other supplies previously shipped as aid to the pre-revolutionary government. Wilson loathed the Bolsheviks, who he believed did not represent the Russian people, but he feared that foreign intervention would only strengthen Bolshevik rule. Britain and France pressured him to intervene in order to potentially re-open a second front against Germany, and Wilson acceded to this pressure in the hope that it would help him in post-war negotiations and check Japanese influence in Siberia. The U.S. sent armed forces to assist the withdrawal of Czechoslovak Legions along the Trans-Siberian Railway, and to hold key port cities at Arkhangelsk and Vladivostok. Though specifically instructed not to engage the Bolsheviks, the U.S. forces engaged in several armed conflicts against forces of the new Russian government. Revolutionaries in Russia resented the United States intrusion. Robert Maddox wrote, "The immediate effect of the intervention was to prolong a bloody civil war, thereby costing thousands of additional lives and wreaking enormous destruction on an already battered society." In 1919, Wilson guided American foreign policy to "acquiesce" in the Balfour Declaration without supporting Zionism in an official way. Wilson expressed sympathy for the plight of Jews, especially in Poland and France. In May 1920, Wilson sent a long-deferred proposal to Congress to have the U.S. accept a mandate from the League of Nations to take over Armenia. Bailey notes this was opposed by American public opinion, and had the support of only 23 senators. Richard G. Hovannisian states that Wilson "made all the wrong arguments" for the mandate and focused less on the immediate policy than on how history would judge his actions: "[he] wished to place it clearly on the record that the abandonment of Armenia was not his doing." Wilson made two international trips during his presidency. He was the first sitting president to travel to Europe. He spent nearly seven months in Europe after World War I (interrupted by a brief 9-day return stateside). Chaumont Attended preliminary discussions prior to the Paris Peace Conference; promoted his Fourteen Points principles for world peace. Departed the U.S. December 4. Manchester Met with Prime Minister David Lloyd George and King George V.
December 31, 1918 – January 1, 1919 France Paris Stopover en route to Italy. Turin Met with King Victor Emmanuel III and Prime Minister Vittorio Orlando. January 4, 1919 Vatican Rome Audience with Pope Benedict XV (The first meeting between a sitting President, and a reigning Pope). January 7 – February 14, 1919 France Paris Attended Paris Peace Conference. Returned to the U.S. February 24. 2 March 14 – June 18, 1919 France Paris Attended Paris Peace Conference. Departed the U.S. March 5. Louvain Met with King Albert I. Addressed Parliament. June 20–28, 1919 France Paris Attended Paris Peace Conference. Returned to the U.S. July 8. On October 2, 1919, Wilson suffered a serious stroke, leaving him paralyzed on his left side, and with only partial vision in the right eye. He was confined to bed for weeks and sequestered from everyone except his wife and physician, Dr. Cary Grayson. Doctor Bert E. Park, a neurosurgeon who examined Wilson's medical records after his death, writes that Wilson's illness affected his personality in various ways, making him prone to "disorders of emotion, impaired impulse control, and defective judgment." In the months after the stroke, Wilson was insulated by his wife, who selected matters for his attention and delegated others to his cabinet. Wilson temporarily resumed a perfunctory attendance at cabinet meetings. His wife and aide Joe Tumulty were said to have helped a journalist, Louis Seibold, present a false account of an interview with the president. Despite his health problems, Wilson only rarely considered resigning, and he continued to advocate ratification of the Treaty of Versailles. By February 1920, the president's true condition was publicly known. Many expressed qualms about Wilson's fitness for the presidency at a time when the League fight was reaching a climax, and domestic issues such as strikes, unemployment, inflation and the threat of Communism were ablaze. No one close to Wilson, including his wife, his physician, or personal assistant, was willing to take responsibility to certify, as required by the Constitution, his "inability to discharge the powers and duties of the said office". Though some members of Congress encouraged Vice President Marshall to assert his claim to the presidency, Marshall never attempted to replace Wilson. Wilson's lengthy period of incapacity while serving as president was nearly unprecedented; of the previous presidents, only James Garfield had been in a similar situation, but Garfield retained greater control of his mental faculties and faced relatively few pressing issues. In Wilson's first mid-term elections, Republicans picked up sixty seats in the House, but failed to re-take the chamber. In the first Senate elections since the passage of the Seventeenth Amendment, Democrats retained their Senate majority. Roosevelt's Bull Moose Party, which had won a handful of Congressional seats in the 1912 election, fared poorly, while conservative Republicans also defeated several progressive Republicans. The continuing Democratic control of Congress pleased Wilson, and he publicly argued that the election represented a mandate for continued progressive reforms. In the ensuing 64th Congress, Wilson and his allies passed several more laws, though none were as impactful as the major domestic initiatives that had been passed during Wilson's first two years in office. Wilson, renominated without opposition, employed his campaign slogan "He kept us out of war", though he never promised unequivocally to stay out of the war. In his acceptance speech on September 2, 1916, Wilson pointedly warned Germany that submarine warfare resulting in American deaths would not be tolerated, saying "The nation that violates these essential rights must expect to be checked and called to account by direct challenge and resistance. It at once makes the quarrel in part our own." Vance C. McCormick, a leading progressive, became chairman of the party, and Ambassador Henry Morgenthau was recalled from Turkey to manage campaign finances. Colonel House played an important role in the campaign. "He planned its structure; set its tone; helped guide its finance; chose speakers, tactics, and strategy; and, not least, handled the campaign's greatest asset and greatest potential liability: its brilliant but temperamental candidate." As the party platform was drafted, Senator Owen of Oklahoma urged Wilson to take ideas from the Progressive Party platform of 1912 "as a means of attaching to our party progressive Republicans who are in sympathy with us in so large a degree." At Wilson's request, Owen highlighted federal legislation to promote workers' health and safety, prohibit child labor, provide unemployment compensation and establish minimum wages and maximum hours. 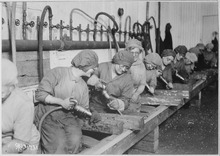 Wilson, in turn, included in his draft platform a plank that called for all work performed by and for the federal government to provide a minimum wage, an eight-hour day and six-day workweek, health and safety measures, the prohibition of child labour, and (his own additions) safeguards for female workers and a retirement program. The 1916 Republican National Convention nominated Supreme Court Justice Charles Evans Hughes for president. A former governor of New York, Hughes sought to reunify the progressive and conservative wings of the party. 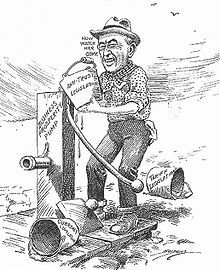 Republicans campaigned against Wilson's New Freedom policies, especially tariff reduction, the implementation of higher income taxes, and the Adamson Act, which they derided as "class legislation." Republicans also attacked Wilson's foreign policy on various grounds, but domestic affairs generally dominated the campaign. As election day neared, both sides saw victory as a strong possibility. The election outcome was in doubt for several days and was determined by several close states. Wilson won California by 3,773 of almost a million votes cast, and New Hampshire by 54 votes. Hughes won Minnesota by 393 votes out of over 358,000. In the final count, Wilson had 277 electoral votes vs. Hughes's 254. Wilson was able to win by picking up many votes that had gone to Teddy Roosevelt or Eugene V. Debs in 1912. He swept the Solid South and won all but a handful of Western states, while Hughes won most of the Northeastern and Midwestern states. By the time Hughes' concession telegram arrived, Wilson commented "it was a little moth-eaten when it got here". Wilson's re-election made him the first Democrat since Andrew Jackson to win two consecutive terms. Wilson's party also maintained control of Congress, although control in the House would depend on the support of several members of the Progressive Party. Wilson involved himself in the 1918 Democratic congressional primaries, hoping to elect progressive members of Congress who would support his administration's foreign policies. Wilson succeeded in defeating several intra-party opponents, including Senator James K. Vardaman of Mississippi. However, the general elections saw Republicans take control of both the House and the Senate. Republicans ran against Wilson's foreign policy agenda, especially his proposal for the League of Nations. Despite his ill health, Wilson continued to entertain the possibility of running for a third term. Many of Wilson's advisers tried to convince him that his health precluded another campaign, but Wilson nonetheless asked Secretary of State Bainbridge Colby to nominate him for president at the 1920 Democratic National Convention. While the convention strongly endorsed Wilson's policies, Democratic leaders were unwilling to support the ailing Wilson for a third term. The convention held several ballots over multiple days, with McAdoo and Governor James Cox of Ohio emerging as the major contenders for the nomination. Though McAdoo had served as Secretary of the Treasury under Wilson, and had married Wilson's daughter in 1914, the president did not back McAdoo's candidacy due in part to McAdoo's perceived lukewarm support for the League of Nations. After dozens of ballots, the convention nominated a ticket consisting of Cox and Franklin D. Roosevelt, the Assistant Secretary of the Navy. Many expected Theodore Roosevelt to be the 1920 Republican nominee, but his death in January 1919 left the race for the Republican nomination wide open. The three major contenders for the Republican nomination were General Leonard Wood, who had been a close friend of Roosevelt, Senator Hiram Johnson, who was Roosevelt's running mate on the 1912 Progressive ticket, and Governor Frank Lowden of Illinois. When the 1920 Republican National Convention met in June 1920, none of the three major contenders were able to accrue enough support to win the nomination, and party leaders put forward various favorite son candidates. The party ultimately nominated a dark horse candidate, Senator Warren G. Harding of Ohio. The Republicans centered their campaign around opposition to Wilson's policies, with Harding promising a "return to normalcy" to the conservative policies that had prevailed at the turn of the century. Wilson largely stayed out of the campaign, although he endorsed Cox and continued to advocate for U.S. membership in the League of Nations. Harding won a landslide victory, taking 60.3% of the popular vote and winning every state outside of the South. Democrats also suffered huge losses in the Congressional and gubernatorial elections of 1920, and the Republicans increased their majorities in both houses of Congress. Wilson is generally ranked by historians and political scientists as one of the better presidents. A 2018 poll of the American Political Science Association's Presidents and Executive Politics section ranked Wilson as the 10th best president. A 2017 C-Span poll of historians ranked Wilson as the 11th best president. However, a 2006 poll of historians ranked Wilson's unwillingness to compromise on the Treaty of Versailles as the fourth-worst mistake made by a sitting president. More than any of his predecessors, Wilson took steps towards the creation of a strong federal government that would protect ordinary citizens against the overwhelming power of large corporations. Many of Wilson's accomplishments, including the Federal Reserve, the Federal Trade Commission, the graduated income tax, and labor laws, continued to influence the United States long after Wilson's death. He is generally regarded as a key figure in the establishment of Modern American liberalism, and a strong influence on future presidents such as Franklin D. Roosevelt and Lyndon B. Johnson. Cooper argues that in terms of impact and ambition, only the New Deal and the Great Society rival the domestic accomplishments of Wilson's presidency. Wilson's idealistic foreign policy, which came to be known as Wilsonianism, also cast a long shadow over American foreign policy, and Wilson's League of Nations influenced the development of the United Nations. However, Wilson's record on civil rights has often been attacked. Wilson's administration saw a new level of segregation among the federal government, and Wilson's Cabinet included several racists. contended that Wilson's wartime isolationism, as well as his peace proposals at war's end, were seriously flawed. Highlighting the fact that American delegates encountered staunch opposition to Wilson's proposed League of Nations, Bailey concluded that the president and his diplomatic staff essentially sold out, compromising important American ideals to secure mere fragments of Wilson's progressive vision. Hence, while Bailey primarily targeted President Wilson in these critiques, others, including House, did not emerge unscathed. More recently, prominent historians such as Thomas J. Knock, Arthur Walworth, and John Milton Cooper, among others, shied away from condemning Wilson and his peacemakers for extensive diplomatic failures in Paris. Instead, they framed Wilsonian progressivism, articulated through the League of Nations, as a comparatively enlightened framework tragically undermined by British and French machinations at the peace conference....Historian Margaret MacMillan, continued this analytical trend in her prize-winning book, Paris, 1919: Six Months That Changed the World (2001), which characterized Wilson as the frustrated idealist, unable to secure his progressive vision due to opposition from old-guard imperialists in his midst. While realists like Lloyd E. Ambrosius questioned the merits of defining Wilsonian progressivism too idealistically, the idea has persisted that well-intentioned U.S. delegates encountered staunch opposition to Wilson's proposals in Paris, and therefore compromised under pressure. Even the great Wilson scholar, Arthur S. Link, subscribed to a version of this narrative. ^ Blum, John Morton (1956). Woodrow Wilson and the Politics of Morality. Boston: Little, Brown. ^ Gamble, Richard M. (2001). "Savior Nation: Woodrow Wilson and the Gospel of Service" (PDF). Humanitas. 14 (1): 4–22. ^ Heckscher 1991, p. 277. ^ Heckscher 1991, pp. 333–335. ^ Heckscher 1991, pp. 350, 356. ^ a b "Thomas R. Marshall, 28th Vice President (1913-1921)". United States Senate. Retrieved 29 August 2016. ^ John Morton Blum, Joe Tumulty and the Wilson Era (1951). ^ Heckscher 1991, pp. 283–284. ^ Rouse, Robert (March 15, 2006). "Happy Anniversary to the first scheduled presidential press conference—93 years young!". American Chronicle. Archived from the original on 2008-09-13. ^ James D. Startt, Woodrow Wilson, the Great War, and the Fourth Estate (2017) p. xii. ^ Heckscher 1991, pp. 316-17. ^ Keleher, Robert (March 1997). "The Importance of the Federal Reserve". Joint Economic Committee. U.S. House of Representatives. Archived from the original on 2008-02-28. ^ Heckscher 1991, p. 409. ^ Robert Whaples; Randall E. Parker (2013). Routledge Handbook of Modern Economic History. Routledge. p. 266. ISBN 978-0-415-67704-2. ^ Heckscher 1991, p. 469. ^ Spencer C. Tucker (2014). World War I: The Definitive Encyclopedia and Document Collection. ABC-CLIO. p. 85. ISBN 9781851099658. ^ Lisa Mastrangelo, "World War I, public intellectuals, and the Four Minute Men: Convergent ideals of public speaking and civic participation." Rhetoric & Public Affairs 12#4 (2009): 607-633. ^ Elna C. Green, Southern strategies: Southern women and the woman suffrage question (1997) pp 5, 86, 173. ^ "Wilson—A Portrait | African Americans". ^ a b Du Bois, W. E. B. (1956-10-20). "I Won't Vote". www.hartford-hwp.com. Retrieved 2016-06-01. ^ Malcolm McLaughlin, "Reconsidering the East St Louis Race Riot of 1917." International Review of Social History 47.2 (2002): 187-212. ^ John Milton Cooper (2011). Woodrow Wilson: A Biography. pp. 409–10. ISBN 9780307277909. ^ William A. Link and Arthur S. Link, American Epoch: A History of the United States Since 1900. Vol. 1. War, Reform, and Society, 1900-1945 (7th ed, 1993) p 127. ^ Robert W. Cherny (2014). A Righteous Cause: The Life of William Jennings Bryan. U of Oklahoma Press. pp. 137–38. ISBN 9780806177380. ^ Heckscher 1991, p. 339. ^ Heckscher 1991, p. 362. ^ Oscar Handlin, "A Liner, a U-Boat . . . and History. American Heritage (June 1954) 6#3 online. ^ H. W. Brands (June 2003). Woodrow Wilson: The American Presidents Series: The 28th President, 1913-1921. pp. 60–61. ISBN 9780805069556. ^ Heckscher 1991, pp. 366–369. ^ Heckscher 1991, pp 384-87. ^ Link 1954, pp 74-96. ^ Ross A. Kennedy, "Preparedness," in Ross A. Kennedy, ed., A Companion to Woodrow Wilson (2013) pp 270-86. ^ Ryan Floyd, Abandoning American Neutrality: Woodrow Wilson and the Beginning of the Great War, August 1914–December 1915 (Springer, 2013). ^ Frances H. Early, A World without War: How U.S. Feminists and Pacifists Resisted World War I. (1997). ^ Andrew Preston, Sword of the Spirit, Shield of Faith: Religion in American War and Diplomacy (2012), pp 240-45. ^ Simeon Larson, "The American Federation of Labor and the Preparedness Controversy." Historian 37.1 (1974): 67-81. ^ John Morton Blum, Woodrow Wilson and the Politics of Morality (1956) p 121. ^ David Esposito, David. "Political and Institutional Constraints on Wilson's Defense Policy." Presidential Studies Quarterly 26.4 (1996): 1114-1125. ^ Link 1954, p 179. ^ Heckscher 1991, p. 427. ^ David F. Trask, The United States in the Supreme War Council: American War Aims and Inter-Allied Strategy, 1917–1918 (1961). ^ Heckscher 1991, pp. 460–462. ^ Heckscher 1991, p. 471. ^ Heckscher 1991, pp. 479–88. ^ Heckscher 1991, p. 458. ^ Heckscher 1991, pp. 551–553. ^ "Woodrow Wilson bio sketch". Nobel Media AB 2014. ^ Cooper 2009, 544, 557–560; Bailey calls Wilson's rejection, "The Supreme Infanticide," Woodrow Wilson and the Great Betrayal (1945) p. 271. ^ George F. Kennan, Russia Leaves the War, p. 472, et passim. 1956, repr. 1989, ISBN 0-691-00841-8. ^ Robert J. Maddox, The Unknown War with Russia (San Rafael, CA: Presidio Press, 1977), 137. ^ Walworth (1986) 473–83, esp. p. 481; Melvin I. Urofsky, American Zionism from Herzl to the Holocaust, (1995) ch. 6; Frank W. Brecher, Reluctant Ally: United States Foreign Policy toward the Jews from Wilson to Roosevelt. (1991) ch 1–4. ^ Peter Balakian (2003). The Burning Tigris: The Armenian Genocide and America's Response. New York: HarperCollins. ^ Bailey, Woodrow Wilson and the Great Betrayal (1945) pp. 295–96. ^ Hovannisian, Richard G. (1996). The Republic of Armenia, Vol. IV: Between Crescent and Sickle, Partition and Sovietization. Berkeley: University of California Press. pp. 10–24. ISBN 978-0-520-08804-7. ^ "Travels of President Woodrow Wilson". U.S. Department of State Office of the Historian. ^ Heckscher 1991, pp. 615–622. ^ Heckscher 1991, pp. 197–198. ^ Pietrusza, David (2008). 1920: The Year of the Six Presidents. Basic Books. p. 191. ISBN 978-0-7867-1622-7. ^ "Woodrow Wilson: Speech of Acceptance". Presidency.ucsb.edu. September 2, 1916. Retrieved September 11, 2010. ^ Heckscher 1991, p. 397. ^ Godfrey Hodgson (2006). Woodrow Wilson's Right Hand: The Life of Colonel Edward M. House. Yale University Press. p. 126. ISBN 978-0300092691. ^ Heckscher 1991, p. 415. ^ Busch, Andrew (1999). Horses in Midstream. University of Pittsburgh Press. pp. 87–91. ^ a b c d e Schuessler, Jennifer (29 November 2015). "Woodrow Wilson's Legacy Gets Complicated". New York Times. Retrieved 29 August 2016. ^ Zimmerman, Jonathan (23 November 2015). "What Woodrow Wilson Did For Black America". Politico. Retrieved 29 August 2016. ^ Scot D. Bruce, "Woodrow Wilson's House: The Hidden Hand of Wilsonian Progressivism" Reviews in American History 45#4 (2017) pp 623-24. ^ Bruce, "Woodrow Wilson's House: The Hidden Hand of Wilsonian Progressivism" (2017) p. 624.
Cooper, John Milton (1990). Pivotal Decades: The United States, 1900–1920. W. W. Norton & Company. ISBN 978-0393956559. Gould, Lewis L. (2003). Grand Old Party: A History of the Republicans. Random House. pp. 175–176. ISBN 978-0-375-50741-0. Heckscher, August (1991). Woodrow Wilson. Easton Press. Keene, Jennifer D. The United States and the First World War (Routledge, 2014). Link, Arthur S. Woodrow Wilson and the progressive era, 1910-1917 (1954). Venzon, Anne ed. The United States in the First World War: An Encyclopedia (1995), Very thorough coverage. Blum, John Morton. Joe Tumulty and the Wilson Era (1951). Cooper, John Milton. Woodrow Wilson (2009), A major scholarly biography. Craig, Douglas B. Progressives at War: William G. McAdoo and Newton D. Baker, 1863–1941 (2013). Shook, Dale N. William G. McAdoo and the Development of National Economic Policy, 1913–1918. (1987). Weaver, Judith L. "Edith Bolling Wilson as First Lady: A Study in the Power of Personality, 1919-1920." Presidential Studies Quarterly 15.1 (1985): 51-76. Graham, Sally Hunter. "Woodrow Wilson, Alice Paul, and the Woman Suffrage Movement." Political Science Quarterly 98.4 (1983): 665-679. Patler, Nicholas. Jim Crow and the Wilson administration: protesting federal segregation in the early twentieth century (2007). Cuff, Robert D. The war industries board: Business-government relations during World War I (1973). Cuff, Robert D. "The politics of labor administration during world war I." Labor History 21.4 (1980): 546-569. Dubofsky, Melvyn. "Abortive reform: the Wilson administration and organized labor, 1913-1920." in Work, Community, and Power: The Experience of Labor in Europe and America, 1900-1925 edited by James E. Cronin and Sirianni, (1983): 197-220. Sebok, Miklos. "President Wilson and the International Origins of the Federal Reserve System-A Reappraisal." White House Studies 10.4 (2011) pp 425–447. Silber, William L. When Washington Shut Down Wall Street: The Great Financial Crisis of 1914 and the Origins of America's Monetary Supremacy (2007). Sutch, Richard. "The Fed, the Treasury, and the Liberty Bond Campaign–How William Gibbs McAdoo Won World War I." Central Banking in Historical Perspective: One Hundred Years of the Federal Reserve (2014) online; Illustrated with wartime government posters. Urofsky, Melvin I. Big steel and the Wilson administration: a study in business-government relations (1969). Ambrosius, Lloyd E. Wilsonian Statecraft: Theory and Practice of Liberal Internationalism During World War I (1991). Ambrosius, Lloyd E. Wilsonianism: Woodrow Wilson and His Legacy in American Foreign Relations (2002). Ambrosius, Lloyd E. "Woodrow Wilson and World War I" in A Companion to American Foreign Relations, edited by Robert D. Schulzinger. (2003). Ambrosius, Lloyd E., "Woodrow Wilson and George W. Bush: Historical Comparisons of Ends and Means in Their Foreign Policies", Diplomatic History, 30 (June 2006), 509–43. Andrew, Christopher. For the President’s Eyes Only: Secret Intelligence and the American Presidency from Washington to Bush (1995), pp 30-65. Bailey, Thomas A. A Diplomatic History of the American People (1980) ch 39-40. Boghardt, Thomas. The Zimmermann telegram: intelligence, diplomacy, and America's entry into World War I (Naval Institute Press, 2012). Burnidge, Cara Lea. A Peaceful Conquest: Woodrow Wilson, Religion, and the New World Order. (U of Chicago Press, 2016). xii, 219 pp. Clements, Kendrick A. "Woodrow Wilson and World War I." Presidential Studies Quarterly 34.1 (2004): 62-82.
Cooper, John Milton, Jr. Breaking the Heart of the World: Woodrow Wilson and the Fight for the League of Nations (2001). Dayer, Roberta A. "Strange Bedfellows: JP Morgan & Co., Whitehall and the Wilson Administration during World War I." Business History 18.2 (1976): 127-151. Doenecke, Justus D. Nothing Less Than War: A New History of America's Entry into World War I (2014), historiography. Doenecke, Justus D. "Neutrality Policy and the Decision for War." in Ross A. Kennedy, ed. A Companion to Woodrow Wilson (2013) pp 243–69. Doerries, Reinhard R. Imperial Challenge: Ambassador Count Bernstorff and German-American Relations, 1908-1917 (1989). Ferns, Nicholas. "Loyal Advisor? Colonel Edward House's Confidential Trips to Europe, 1913–1917." Diplomacy & Statecraft 24.3 (2013): 365-382. Floyd, Ryan. Abandoning American Neutrality: Woodrow Wilson and the Beginning of the Great War, August 1914–December 1915 (Springer, 2013). Gilderhus, Mark T. Diplomacy and Revolution: US-Mexican Relations under Wilson and Carranza (1977). Grant, Philip A. "World War I: Wilson and Southern Leadership." Presidential Studies Quarterly 6.1/2 (1976): 44-49. Haglund, David G., and Deanna Soloninka. "Woodrow Wilson Still Fuels Debate on 'Who Lost Russia?'." Orbis 60.3 (2016): 433-452. Haley, P. Edward. Revolution and intervention: the diplomacy of Taft and Wilson with Mexico, 1910-1917 (1970). Katz, Friedrich. The Secret War in Mexico: Europe, the United States, and the Mexican Revolution (1981). Kendall, Eric M. "Diverging Wilsonianisms: Liberal Internationalism, the Peace Movement, and the Ambiguous Legacy of Woodrow Wilson" (PhD. Dissertation, Case Western Reserve University, 2012). online 354pp; with bibliography of primary and secondary sources pp 346–54. Kennedy, Ross A. "Woodrow Wilson, World War I, and an American Conception of National Security." Diplomatic History 25.1 (2001): 1-31. Knock, Thomas J. To End All Wars: Woodrow Wilson and the Quest for a New World Order (Princeton UP, 1992). Levin Jr., N. Gordon. Woodrow Wilson and World Politics: America's Response to War and Revolution (Oxford UP, 1968), New Left approach. Powaski, Ronald E. "Woodrow Wilson Versus Henry Cabot Lodge: The Battle over the League of Nations, 1918–1920." in Powaski, ed., American Presidential Statecraft: From Isolationism to Internationalism (Springer, 2017). 67-111. Startt, James D. Woodrow Wilson, the Great War, and the Fourth Estate (Texas A&M UP, 2017) 420 pp. Stevenson, David. The First World War and International Politics (1991), Covers the diplomacy of all the major powers. Thompson, John A. "Woodrow Wilson and World War I: A Reappraisal." Journal of American Studies 19.03 (1985): 325-348. Throntveit, Trygve. Power without Victory: Woodrow Wilson and the American Internationalist Experiment (2017). Walworth, Arthur; Wilson and His Peacemakers: American Diplomacy at the Paris Peace Conference, 1919 (1986). Williams, William John. The Wilson administration and the shipbuilding crisis of 1917: steel ships and wooden steamers (1992). Woodward, David R. Trial by Friendship: Anglo-American Relations, 1917–1918 (1993). Keene, Jennifer D. "Remembering the "Forgotten War": American Historiography on World War I." Historian 78.3 (2016): 439-468. Baker, Ray Stannard ed. The public papers of Woodrow Wilson (8 vol 1927-39). much less complete than Link edition, but more widely available in libraries. DiNunzio. Mario R. ed. Wilson: Essential Writings and Speeches of the Scholar-President (2006), mostly pre-1913. Link. Arthur C., ed. The Papers of Woodrow Wilson. In 69 volumes. Princeton, NJ: Princeton University Press (1966–1994); a complete collection of Wilson's writing plus important letters written to him, plus detailed historical explanation. This page was last edited on 27 March 2019, at 07:15 (UTC).